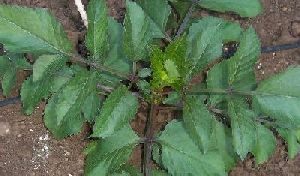 When your dahlias have grown, 12 to 24” and have developed a full 3rd set of leaves, pinch the center out. This will produce a bushier plant with more blooms. After you have completed your planting, it is not necessary to water the tubers; in most areas., spring rains will supply the water necessary until the weather warms. During the summer months, we soak the dahlias using a water drip system 2 to 3 times a week. The water needsto soak the soil 4-6” in depth. It is also necessary to occasionally use overhead watering to keep the flowers and foliage healthy. Dahlias require a low nitrogen fertilizer. We use 5-10-10 when we plant the dahlias. We then will fertilize approximately 30 days after planting, and then 3 to 4 week later. It is important not to use compost or fertilizers high in nitrogen. 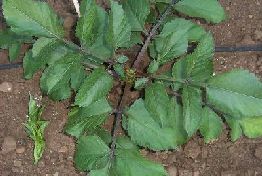 This will cause small blooms, no blooms, and weak stems. Hand weeding is the only weed control you should use. We attempted to use Preen, and it disrupted the growth of the dahlias.